Absolute Plumbing was established in November of 1999 by Robert Gugino. We are a family owned and operated business. 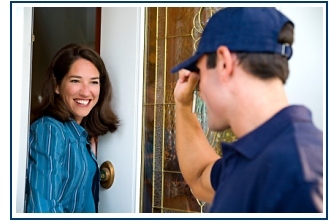 We pride ourselves in putting the customer first and taking care of their immediate needs. A+ rating by the Better Business Bureau! We offer convenient 2 hour appointment windows at our customer's request. "The team from Absolute is thorough, professional, and reasonably priced. Who could ask for more?" "I definitely give Absolute a 5 Star rating. I had to stop at 5 because they only had 5 Stars. They responded to my email for help with a nearly immediate phone call. The gentleman who called was professional and informative. He scheduled the call and the servicemen appeared at my door at the time expected. I was also told who to expect, by name, which was very nice. Both men in the service crew listened and were diligent in locating and solving the problem. Both men were courteous, professional and personable. I had complete confidence while they were in my home. My problem was completely fixed. They left my house neat as a pin. It is very pleasant surprise to find a competent company with great customer service. BRAVO and lucky me. I strongly recommend. Thanks Absolute!!!"